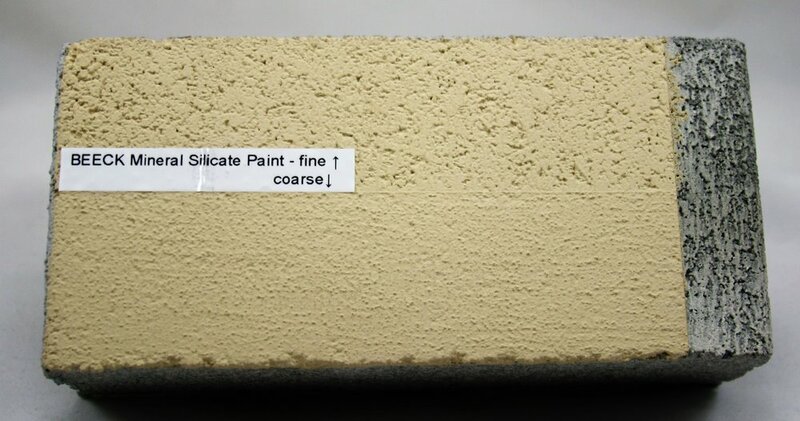 A traditional SOL-silicate exterior or interior paint for use on all synthetic resin coated (previously painted) or raw uncoated brick, masonry, concrete or other mineral facades. BEECK Beecko-SOL is a traditional SOL-silicate paint for use either exterior or interior on all synthetic resin coated (previously painted) or raw uncoated brick, masonry, concrete or other mineral facades. The modified Silica-Sol / potassium silicate binder gives this product more flexibility regarding areas of application. Beecko-SOL is ideal for renovation, restoration and new construction projects where a wide application parameter is required. The BEECK exclusive ASF (Active Silicate Formulation) provides the best bonding properties and an extremely durable finish. Beecko-SOL is available in white and all 200 colors in the BEECK Mineral Paint Color Chart. Custom color matching is also available. Please contact us for pricing on custom color matching.